Do you have a little water bug scurrying about at home? Are you tired of cleaning up the bathroom floor after your toddler plays great white whale during bathtime? If you’ve got a water-lover on your hands, perhaps it’s time to invest in a water table. When you have a small child, it’s really hard to find outdoor toys that are appropriate for them. This is where water tables really come in handy. Water tables are beneficial to a child’s development in several ways, perhaps the most important being sensory processing. But how do you know which one is the best water table for toddlers? We’ll go through some important things to keep in mind as well as reviewing some of our personal favorites. Use the links above to check the latest prices or read our in-depth water table reviews below. Water tables aren’t just a fun outdoor toy for kids, they also offer a pretty extensive list of educational benefits as well. From hand-eye coordination to scientific thinking, water tables cover just about every aspect of child development. Of all the benefits water tables have to offer, perhaps the most prominent is the sensory experience it provides. In many cases, water tables also allow for spots where sand can be added. This allows children to compare the feelings of water and sand (source). Water tables come in a variety of different styles. Some are equipped with all kinds of extra features, while others are more simply made. Depending on your family’s lifestyle and the types of toys you allow in your home, here are some features to look out for. If you don’t have much shade in your yard, a water table that comes with a canopy or umbrella is definitely something you’ll want to look for. The sun is no joke. If you plan on spending lots of time outdoors, having adequate shade will not only protect your child, but they’ll be more comfortable too. Even if the weather report calls for lots of cloud coverage, a canopy can still be beneficial. While the clouds block most UVB rays, UVA rays can still be dangerous (source). Another thing to ask yourself is how complex you want your toddler’s water table to be. Do you want one with all the bells and whistles supplied, or are you looking for one where you can add your own toys? Some of the more complex water tables come with features like strainers, pieces to make a water maze, and water wheels, among other things. If this interests you, you’ll have plenty of options to choose from. These add-ons are not only fun, but they offer a slew of benefits to your child, including learning about cause and effect, sensory processing, and scientific thinking. You may find that some tables come with lids and other storage compartments. This will come in handy if you plan on leaving the water table outside. Bugs and other critters may be lurking and having a lid to put over the top of the table will keep the pests away and make cleaning much easier. If you plan on storing it in a shed or garage when it isn’t in use, perhaps finding something that isn’t too heavy is also a good option for you. Additionally, there are several compact water tables on the market that make storage easier for parents. 4. Drain or No Drain? Who wants to deal with water build-up and other yucky grime? Definitely not me, so finding a water table with a drain should be at the top of your list. When water sits in a water table for a while, it starts to accumulate dirt and other particles from nature. You’re going to want to clean it out at least once a month, but some designs are awkward to tip over to release the water. Others will be too heavy for some to move, so having a drain plug to drain out the water will make your job much easier. Water tables typically live outside, so size isn’t as much of an issue as it may be with other toys. If you live in an apartment or you share outdoor space with other people, you may still want to keep size in mind when shopping. Most water tables won’t give you an issue as they can usually fit in a corner on a porch or balcony very easily. Some companies also make water tables in smaller sizes that are perfect for younger toddlers. Now that we’ve gone over the important stuff, it’s time for the fun part. Choosing the right water table for your toddler can be hard — after all, there are so many options to choose from. We’ve narrowed it down to the best of the best for you. If you’re looking for something to complement the rest of your backyard landscape, this Step2 playtime patio may be the best pick for you. This is also a good choice for yards that don’t offer a lot of shade, as it comes with a removable canopy. Unlike other outdoor playhouses, this particular one is wheelchair accessible, making it the perfect option for families who have children with disabilities. 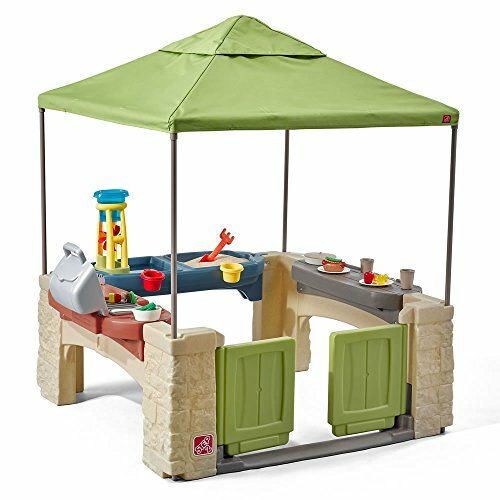 It’s also multi-purpose as it comes with a sand and water table, along with a make-believe food prep area or lemonade stand. 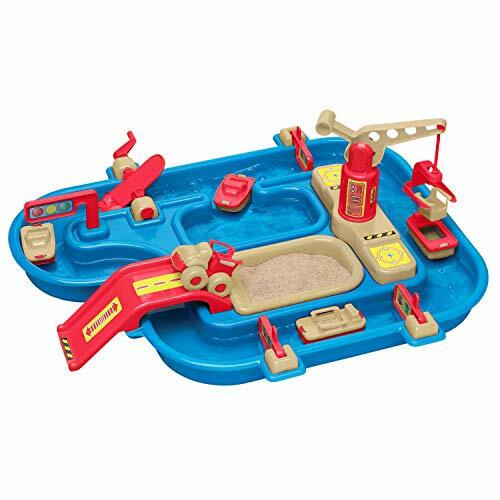 It also includes several accessories for the water and sand area, as well as some play food. This set is suitable for children ages 2 and above. 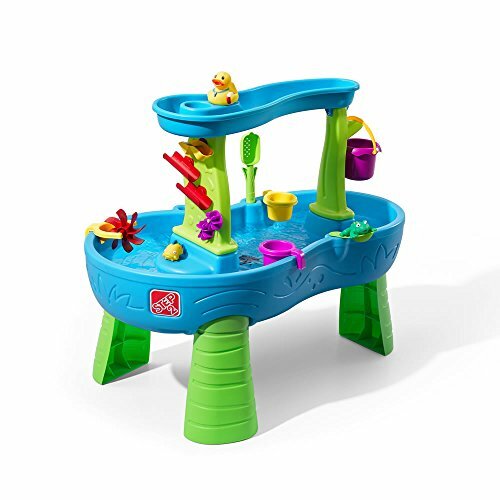 This Step2 water table playset is a popular choice among parents. It’s available in two themes: a gender-neutral pond theme as well as a pink and purple unicorn theme. It has two tiers— the top tier features a spot to fill with water so you can watch the “rain” fall down to the bottom basin. The playset also comes with two water squirt toys, a bucket, and a 13-piece accessory set. The water maze featured on one of the pillars is a good way to teach tracking skills and cause and effect. 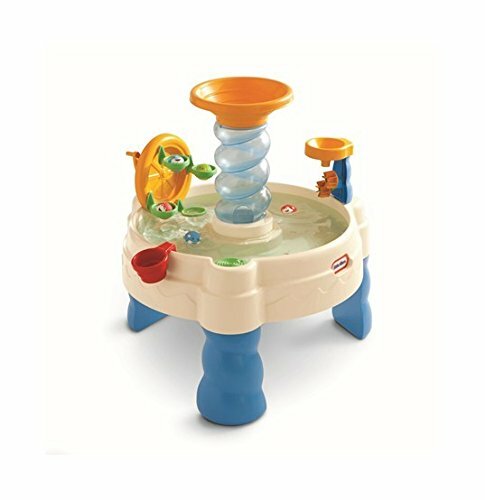 This water table is recommended for children ages 18 months and over. If you’re a family with multiples, this water table is ideal if they’re younger toddlers. It’s recommended for ages 18 months and above and has plenty of space for up to three kids to enjoy the water. This water table is great because it has two separate basins where kids can play differently. The top basin can hold up to 2.22 gallons of water and the lower basin will accommodate up to 3.24 gallons. It comes with 11 accessories and an umbrella for shade. 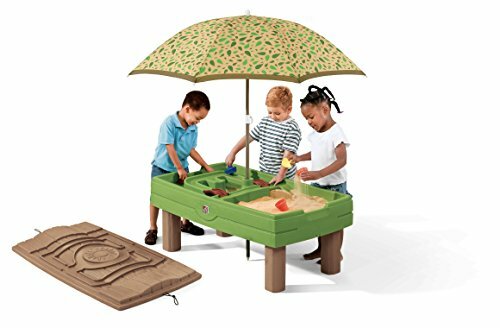 The umbrella only covers half of the table though, so be sure to use sunscreen and other sun protection when playing with this table. Some adult assembly is required. Do you have a little paleontologist? This dinosaur-themed table may be just the right toy for them. This prehistoric water table comes with a 7-piece accessory set that includes dinosaur figures, two scoops, and a shovel/rake combo. It also comes equipped with a drain plug and a lid for the sand side of the table, to keep away wet weather and outdoor pests. 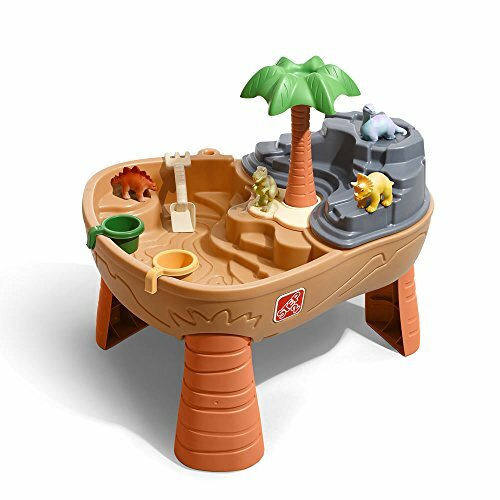 The Dino Dig table is a good size and design for children to play together and is best for children ages 24 months and over. If you’re looking for a multi-purpose option, this activity table by Exercise and Play is a good choice. This table is unique in that it serves as a water table, standard table, Lego table, and is good for storage as well. A great feature of this set is that it comes with two chairs and 25 jumbo blocks too. The table has rounded edges, making it safe for toddlers, and is suitable for children ages 18 months and up. Some assembly is required, but pieces snap into place easily and its lightweight design makes it easy to transport inside and outside. If sun coverage is a major concern for you, this water and sand table combo is a great option for your yard. It comes with a removable umbrella that’s big enough to provide coverage for the entire table. There are two separate areas — one for sand and one for water. The sand area can hold up to 20 pounds and the water area comes with a convenient drain plug for easy cleaning. The drain plug is handy because this particular table weighs a lot when filled with water and wouldn’t be easy to tip over for cleaning out. The table comes with eight accessories and has a lid with elastic ties to securely protect the contents inside. The recommended age for this is 2 years and up. This one is unique because it comes with a ball-tower for added fun. Toddlers can drop the ball at the top and watch them spiral down into the water. There is also a Ferris wheel they can move, with a crank to pick the balls up out of the water. The Spiralin’ Seas Waterpark play table also comes with a funnel, spinner, water cup, and five balls that can squirt water. 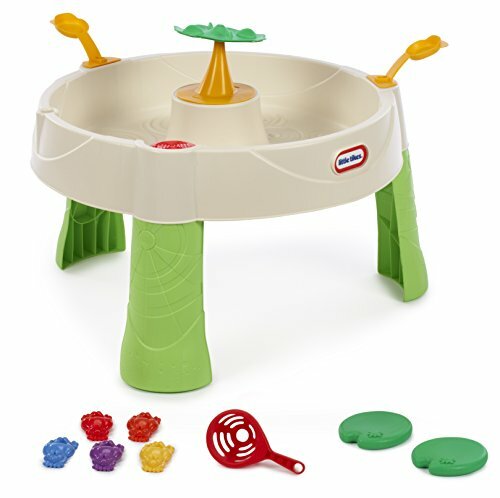 This play table can hold up to 7 gallons of water and is recommended for toddlers starting at 24 months old. However, many users said their children enjoyed it at just 12 months old. It’s low to the ground, so even smaller children can enjoy it, plus you can remove the legs, put it on the ground, and have a splash party. Some assembly is required. This one is a little different because it isn’t technically a table. The Step2 Waterfall Discovery Wall is a giant water maze that children can pour water into and then watch as it cascades down the maze to the basin. 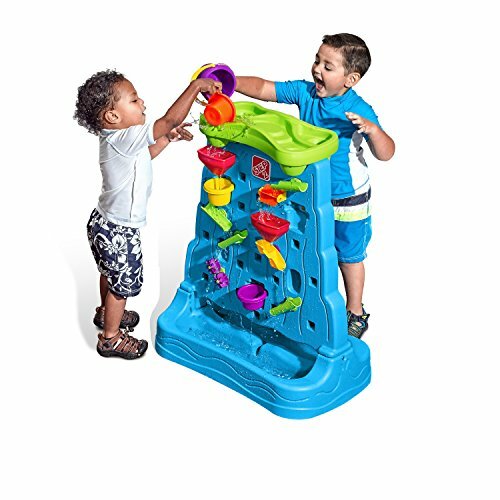 The set comes with 13 accessories, and the maze pieces can be manipulated and moved throughout the wall for endless water fun. Because the wall is double-sided, this playset is optimal for two children to play at once. This is especially good for families with multiples. Suitable for ages 18 months and over. If American-made is an important feature for you, this Simplay product is made of durable, double-walled plastic completely from the United States. 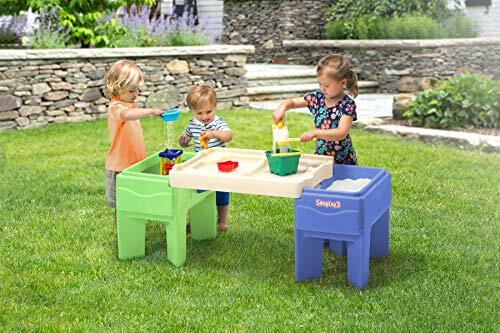 This is a great multipurpose water table that can be used inside or outside, and the legs pull out to reveal storage bins inside. The tabletop is double-sided with one side being a flat top and the other split into two sections to use for sand and water play. It’s recommended for children ages 2 years and above. 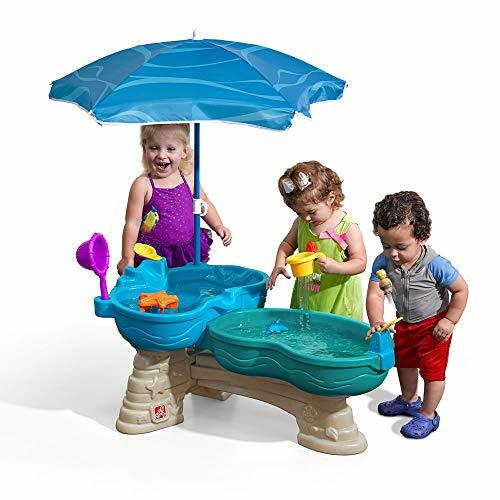 This water table is ideal if you’re looking for something both simple and stimulating. The circular design holds up to 7 gallons of water and eight accessories. This table is great because it comes with a fun game that requires children to launch toy frogs onto the lily pad attachment in the middle of the table. There is also an option to turn the water into a lazy river by turning a spinner on the side to create gentle waves. 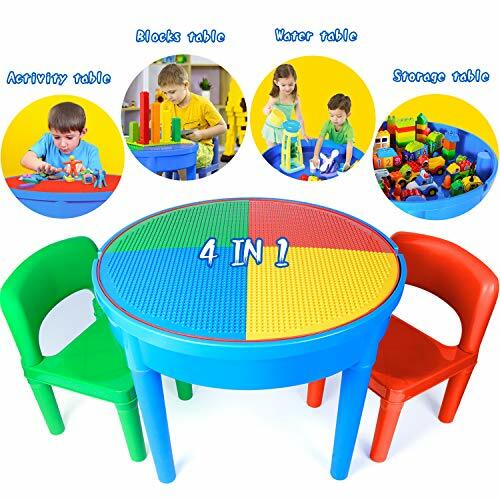 This Little Tikes table is suitable for children aged 24 months and above, and some assembly is required. If you’re a fishing family, this is a great water table to incorporate into your little one’s lifestyle from an early age. 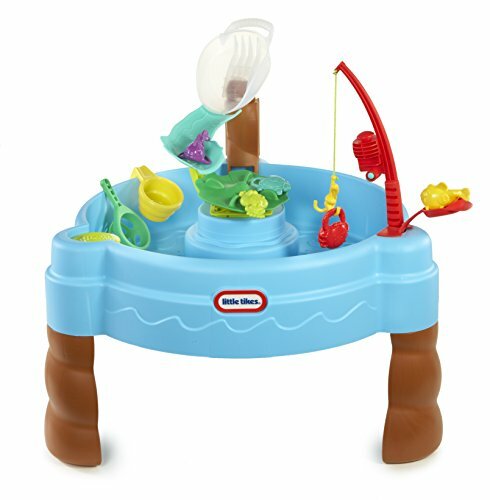 The Little Tikes Fish N Splash water table includes a fishing pole, along with five little critters, a water cup, and a fishing net. It holds up to 7 gallons of water and is super lightweight for when it’s time to drain the water out. It also has a fun fish flinging game you can play during water play time. This set is recommended for children aged 2 years and up. 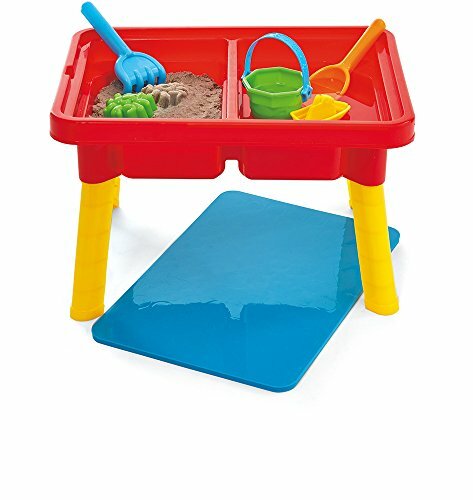 Parents looking for a small water table that can be easily stored will love the Kidoozie Sand ‘n’ Splash table. 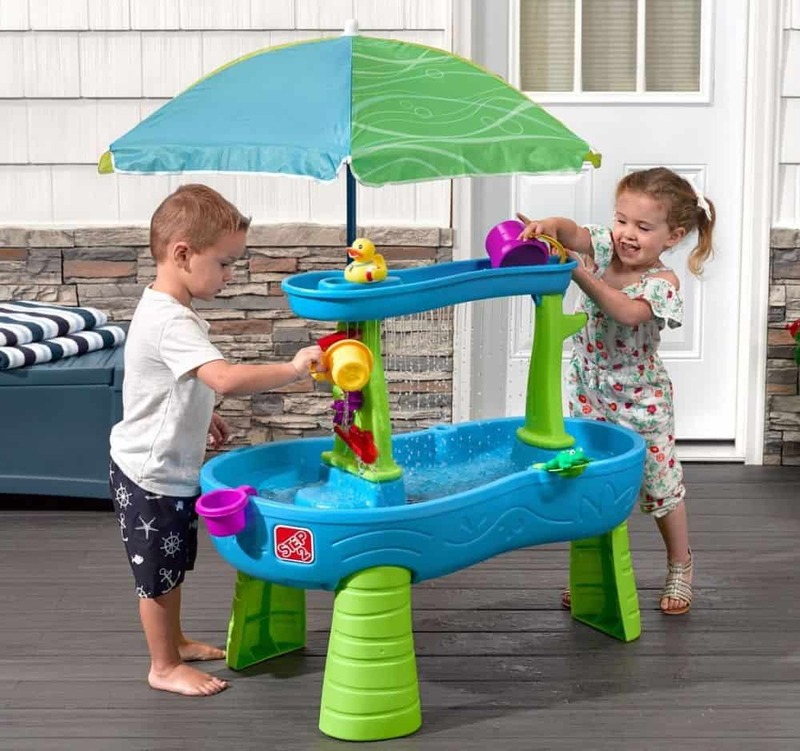 This water table is super lightweight and while it’s recommended for children ages 24 months and above, it could still be beneficial for toddlers as young as 12 months. It comes with a bucket, shovel, rake, boat, and crab stamp to be used in the sand. There are also two separate areas, one for sand, and one for water. The legs also snap off if you want to place the basin on the ground rather than have it slightly elevated. This set from American Plastic Toys is the perfect water table for parents looking for a portable option. The playset weighs less than 4 pounds and is only around 2 feet wide. The basin for the water isn’t very deep as it only accommodates around 2 to 3 inches of water. This makes it great for both indoor and outdoor use, so you’ll still get plenty of use out of it during the winter time. Suitable for children ages 18 months and over. As parents, we always want what’s best for our kids, especially when it comes to their toys. With all the options on the market, trying to narrow things down to the best of the best is hard. That’s why we did it for you. My personal favorite is the Step2 All Around Playtime Patio. I love that it’s accommodating to children with disabilities and that it includes more than just a water table. This ensures hours of playtime fun. Let’s be honest, sometimes we just need a break and this particular table gives parents that much needed time to sit back for a while and relax. Who’s the water bug in your life that needs a water table? Have you purchased a water table from this list? Let us know your experience!